Hi there! My name is Colleen Flowers and I'm a Holistic Reproductive Health Practitioner that teaches Fertility Awareness. Don't know what that is? In less than 10 minutes, the short film Miscontraceptions by Cassie Moriarty gives an entertaining and scientific overview of what Fertility Awareness is... keeping track of the changes in your body so that you can accurately and confidently answer the question you ask yourself everyday, "Am I Fertile? Yes or No?" This yes or no answer is invaluable when you're trying to get pregnant or trying to avoid getting pregnant! Click to watch the film. Wanna see yours truly? I appear 3 times in the film at 6:13, 8:26, and 8:57. Birth control. You've been there and done that! If you're ready to avoid pregnancy without any side-effects, I'm here to help! Instead of getting answers to your questions from complete strangers through online forums, I can offer you individualized and professional information. without using synthetic hormones or devices. baby-making?! I'd love to help you on this journey. which is so much better than Googling! because it ain't your grandma's Rhythm Method!!! I'm a Fertility Awareness Educator and I teach the Sympto-Thermal Method of Fertility Awareness. That means keeping track of and charting the changes of your cervical fluid and the changes of your morning temperature throughout your cycle. I offer One-on-One Fertility Awareness consults virtually (via phone or Skype or FaceTime). To learn Fertility Awareness to Avoid Pregnancy, please purchase the Online Natural Birth Control video. 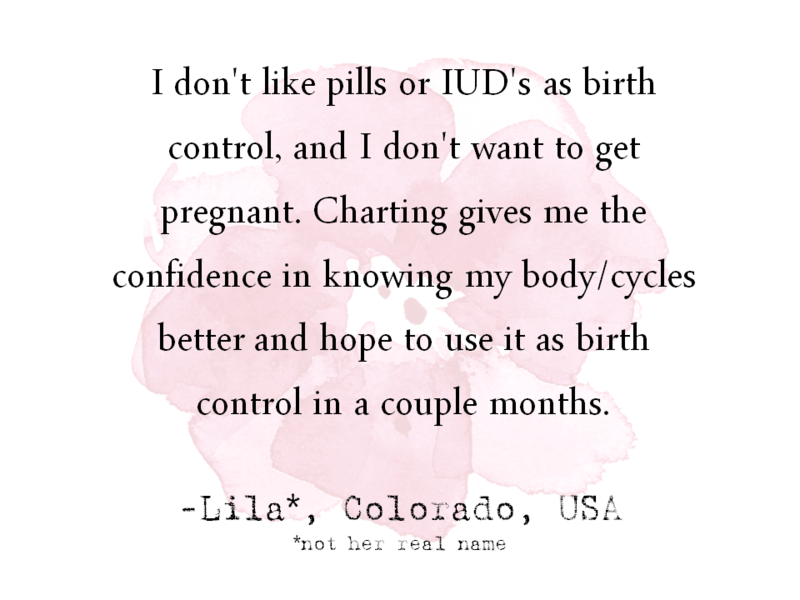 Charting your cycles can bring so much freedom and valuable information because you can use Fertility Awareness for a variety of reasons: avoiding pregnancy naturally, increasing the chances of pregnancy holistically, and being better-informed about your reproductive health and menstrual cycle are just a few.